When you eat, you have to consider something more than just the amount of calories or pounds you are likely to gain from what you’re putting in your mouth. What you eat also does something to a chemical balance in your body, which when disrupted can cause various health problems. If currently you are experiencing things such as frequent headaches, fatigue or recurring allergies, fever or colds, then you might already be having that chemical imbalance in your body. What you need to do is to consume the right kinds of foods that will restore this imbalance to a normal and healthier one. 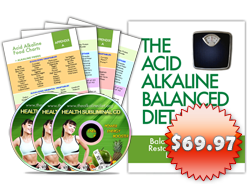 In the body, both alkaline and acid simultaneously occur, producing a certain ratio. This alkalinity or acidity is measured on a scale of 0 to 14, the pH balance – wherein 7 is considered neutral, lower than 7 is acidic, and higher than 7 is alkaline. The body is better off with high alkalinity than acidity. There are many factors why the pH level of the body becomes predominantly acidic. When this level is reached, the body must be supplied with alkaline in order to neutralize and get rid off the excess levels of acid trapped inside the body. However, if not properly put right, acidosis takes place – which is linked to a lot of imaginable health problems, from minor to lethal ones. In order to prevent excessive acid in the body or, if in case you are afflicted with an illness brought about by acidosis, it is key to keep the body’s pH level at normal. 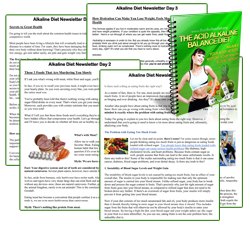 One way of maintaining this chiefly alkaline level in the body is through the diet approach. 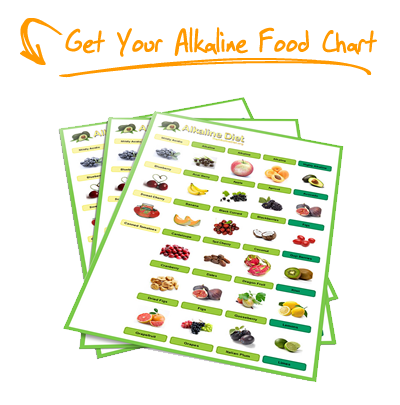 Many people will find sticking to a diet consisting of alkaline foods sources somewhat difficult. This is because, in order to restore the normal chemical level in the body, one must avoid some of the most hard-to-resist foods on the planet: meat, meat products, dairy products, seafood, chocolate, instant foods, condiments alcohol, coffee, carbonated beverages and others. So if you are accustomed to eating fast food regularly, you need to resist temptations all around you in order to religiously follow a diet rich in alkalizing foods. As a general rule of thumb, your daily meals should be 3/4 alkaline – this means that each time you eat you should see to it that the foods you put in your mouth should contain 3 times as much alkaline as they do acid. The following are some commonly-known alkaline foods. It pays to have them on a list and placed on the refrigerator door, or become staples when you do your grocery shopping. Due to the tremendous researches alkaline foods receive throughout the years, list of alkaline foods may have some variations. Even when you look it up on the internet, one list of alkaline foods may be slightly different from another list. In general, you may have as much dark green leafy vegetables as you like and freshly grown fruits; and sweets, meat and meat products should be out of the list. Well-chewed grains become more alkaline. I enjoy the info. I’ve already cut most of the acidic foods out of my diet, but still suffer from intense migraines and debilitating body pain. I’ve stopped taking ALL Rx drugs and have found relief mostly through accupuncture. @Dennis : Acupuncture definitely is helpful towards helping your body in migraines and body pain. Just out of curiosity, where are you from? I reduced most of the acidic foods, however I was given an alkalizing and acidic food list which do not quite correspond with your list as chicken was listed as slightly alkaline, so I based my diet on vegetables and chicken only. Please can you tell me which is the right diet? @Joe : I’m afraid chicken is not alkaline. Where did you manage to get your acidic food list? Like Dennis, I also have suffered from intense body pain and migraines … for 20+ years, with no accident to trigger the pain. The alkaline diet is helping slowly and it is a diet I plan to stick with for life. 1) pHenomonal water – it is an alkaline water that you drink … to get your body into an alkaline state very quickly. My doctor told me about it. Proper diet is the long-term (probably less expensive) way to maintain the alkalinity in your body. 3) “RT” – Reconstructive Therapy – This non-surgical medical treatment has been shown in research studies to strengthen injured/weakened support bands (ligaments, tendons, and capsule) that surround joints. Stronger “soft tissue” bands allow your joints to function more normally again. This, in turn, increases your mobility and flexibility and reduces your pains. “RT” has few providers in the country … one is close to Houston, TX, in Humble. (I think that “RT” is similar to “prolotherapy” … which is offered by many providers across the country … I found two in my hometown, both covered by my insurance plan). I also found that for “pain management”, accupunture and chiropractic worked very temporarily. But, for “permanent relief”, these 3 things, along with the alkaline diet, are what I have discovered so far. Why do acid/alkine food lists always vary? Lemons?? They’re ph2-3 – ie very acidic, as in citric acid…aka Vitamin C… Originally thought your info sounded interested but after that how can we be sure the rest is true?! @Angela: Hi Angela, in this alkaline foods section, we are talking about the pH of the food itself when we consume it. Lemons is alkaline because of it’s mineral content and it’s ash residue that is left in our body. Thanks for the valuable information. I was searching for a proper diet to help get rid of my ulcer and didn’t realy know whats was going on in my body until I found this website. I know now by my past eating habits I must have a high acidic body. And making things worst by drinking to much milk, but I did combinded 100% Aloe Vera Juice with it, but the comfort was temperary. Had to wake up every hour to drink this stuff to get some sleep. So I’m going to take purchase a Test Kit for a Acidity test in the morning. In changing my diet does fruit and vegetable juice’s maid from “Concentrate” no-good? And can you recommend the best diet for my cast? Hello! does fruit and vegetable juice’s maid from “Concentrate” no-good? @Eric: I guess no one really know what’s that is. Is that a drink or something? It’s best to only drink the fresh juices as those contains the most enzymes, vitamins, and minerals. Would this make the Juice highly acidic or maintain it’s original state? All you do is add water…..
@Eric: Think about it this way, any fruits or vegetables which has been put into packets or bottles are no going any more. If you put a cut apple out in the open, what will happen to the apple? It will oxidized and turn brown right? To be able to keep the juice for a long time, the fruit juice are pasteurized and frozen before it is being shipped elsewhere. Which is better? Fresh or frozen? @dorapurple: The moment you’ve add white sugar, the entire drink becomes acidic. Try to drink it without sugar and it’ll be much better for your health. Other than that, it should be quite alright to drink these 2 products. food store which I uses sometimes. Is this ok? it does not burn my stomach and digest better. What about spring water instead of tap water? I’m very interested about your comment about water. I’d really love an answer to the whole question of should we be drinking alkaline water? I tested our filtered water (reverse osmosis) and found it to have a pH level of 5.5 – not good! Does anyone have any information, comments about or experience with alkalising drops and their benefits? @Valerita Kellman: It’s good that you totally stay away from sugar altogether. You might want to take note of agave sweetener – it may not be as good as you think. The best alternative I felt is molasses. Distilled water is the best and perhaps you want to add a lemon into your water to make it alkalizing. @Sandra P: Instead of using alkalising drops, why don’t just squeezing some lemon or lime juice into water to make it? It’ll be a much alkalising and natural alternative. I cannot find the PH value for pure Pomegranate juice, any idea? I was diagnosed with rectal cancer 10 days ago. I am 46 years old. Since then I have only eaten fruit until 12 and salads and veges after 12. I have no meat, chicken, dairy, sugar, no starch of any kind. I am starving! I check my PH on my tongue and in my urine morning and evening and I cannot bring it above 6.5. WHAT am I doing wrong? It is imperative that I improve my PH immediately. Is Barley Green the only option or should I drink bicarb? Prior to this, I ate a lot of sugar, cheese and white bread. Perhaps it takes a while to work out of your system? To Cathy… Try adding almonds, sunflower seeds, flax seeds or lentils. You might find that they help keep you fuller longer. They are on the approved list. Just an idea. and my saliva was 4.5 Everyone is diabetic, I have not been diagnosed, I have sugar in my urine, but secondary test do no t confirm. I have extremely tired episodes-exhausted. Low potassium, please recommend what to do until I see a doctor. acid in grapefruit? Is this still highly acidic? Looking through the different sites there seems to be quite a descrepancy about which foods are alkalzing. I am now very confused. Who is right anyways? Lemon has a ph of 2, not 9. It’s one of the most acidic natural things people eat. I have fibromyalgia and my body always feels sore to the touch. I stupidly went to rheumatologist who gave me a drug called Savella As the dosage increased I had side effects, so he told me to reduce the dosage. Then I started to get a burning scalp and I couldn’t stand the medicine so I stopped it and now I still have a burning/painful scalp almost every day for almost 2 months. I was told it has to do with neurotransmitor inhibitor reuptake. Can this diet help with this horrible feeling that I can’t seem to get rid of and my fibromyalgia symptoms? Is there a daily diet/regime schedule for an alkaline diet i can follow to get my PH back to the normal range? @Rebecca? Are you just trolling or have you read the post about lemon being alkaline in your body (not in your tongue or stomach)? Are you a registered dietician? Hi, after many years of self abuse and at 40 feeling like 70, i have decided to try an alkerline diet to see what benefits it will bring. Can anyone reccomend a realistic way of starting and any other helpful sites/books or advise. My husband has been diagnosed with Interstitial Cystitis and suffers greatly from this . We use drops in his water and to relieve painful urination he drinks aluminum free baking soda .Is there a diet regimen that a picky man can follow or some foods he can ad to his diet. I have not bought strips to test his urine but have been reading about them. It anyone has any tips we would greatly appreciate them . He does not sleep at night because of the frequency and pain in the urination. We have read that this disease is effected from alkalinity in the urine. What is the difference with having high inflammation and acid body. Are they the same?